Great Website and easy to use. Great telephone person-to-person customer service. Reasonable prices. Leather flaps tie snug and perfect. I love the blueish gray color. Authentic style. Make sure you get the right size. It may be slightly off. The LG size was too small so I had to exchange for XL but worth the exchange. Only main complaint is the fur sheds, which shouldn't normally happen. I have a similiar rabbit fur hat put out by Columbia Sports Wear many years ago. I have had it for 15 years and it never sheds. Also the fur of the Columbia hat feels more healthy and full where as this one feels a little dull. This is probably due to poor husbandry/farming of the rabbits therefore it would be nice if the the fur and hats were actually produced in Russia, Canada or Eastern Europe. Sorry, but although it may be more cost effective, I have not had the best of luck with most products made in China. Overall I am very glad I purchased the hat and hope I can figure out a way to de-shed it. When they say "Full Fur", they mean that the ear flaps are fur on both sides. The entire outside is fur except for the straps holding the ear flaps in place. The straps tie together instead of snapping, which is neither a plus or a minus, but a fact worth knowing. The face flap is sewn in two corners to the crown so that it does not come down. I've seen other fur caps that have a face flap that attaches via snap; however, I cannot readily think of a practical application for having the face flap down, so this is a plus. The hat is VERY warm, protects the ears nicely; however, be warned that rabbit fur is also an excellent sound insulator. Count on having most sounds muffled. Overall, an EXCELLENT winter hat! This is my very first Ushanka, I was looking online for a good one as I love the design, and looks and know the Russians know how to combat the harshest of cold weather...plus I shave my head and I hate a cold dome! I found this site and this hat, ordered it and when it arrived I was EXTREMELY pleased, The fur is lush and warm, the inner quilt lining is great and well made. This is BY FAR the warmest hat I have ever owned...and the most comfortable fitting no squeezing or headaches from wearing it. In fact I find many times I need only wear a sweater over a t shirt and this hat and I can stay very warm...a coat adds to the comfort and warmth. 5 starts, I look forward to purchasing again...well made and worth every penny. Hat arrived this morning via standard postage in eight days. Nicely made and just right for the current cold weather we are experiencing in the UK at the moment. I realise for you Canadians our winters must seem mild. Looks so much better than the standard beanie hat and works with both smart and causal clothes. I normally take a large but ordered extre large after reading the comments about sizing. I made the right decision as I'm sure the large would have be too small. I was at the upper limit of the large sizing guide. Package arrived one day earlier than expected, and the hat is high quality and beautiful! I did totally mis-judge the size and ordered a medium, however I realized I actually need a large. Sending the medium back for a large today, and very satisfied with the service provided! i will be making future purchases as well (without the faux pas of ordering the wrong size next time). You won't be disappointed in this company, or any of their products. I bought this hat as a birthday gift for my son. He had one previously but it was falling apart. I ordered a Large, which was what he had before but it was too tight. Because I ordered it early by the time I gave it to him it was past the 15 day period return policy. So I had to purchase another one. The X Large fits perfectly and he loves it. I just wish I didn't have to pay twice the money for 1 hat. I brought this hat for my husband - in the grey rabbit fur and I brought the woman's hat in white rabbit fur for myself. These hats are so incredibly warm and so soft. They keep you head and ears totally protected from the cold icy air of winter. Now it is fun to go outside when it's cold! You won't be disappointed in this hat - beautiful :-) I will definately be purchasing more products - cant wait to get some mittens and boots! This is my second... So I feel that conveys my satisfaction. It is very warm and durable. Grey rabbit fur to match my grey... and the fact that it is the abundant rabbit soothes my conscience -- personally, if they were coyote or fox or beaver I would imagine their suffering more acutely. One small complaint... Despite the XL tag, this hat is much smaller than the last. Hope it stretches. Very Nice and Very WARM Hat! I've gotten several compliments on the hat and my dog only barked at it for a few minutes before I let her sniff it. Seriously, the fur is very nice and this hat is extreamly warm. I'm bald so I feel the difference quite strongly. It's not made in Russia unfortunatly but I like the hat and wouldn't hesitate to recommend it to someone else looking for something to keep their head warm in a stylish manor. Well... I wrote a review over a week ago but evidently it has not been posted -- probably because I mentioned my disappointment that the inside tag listed the manufacturer was from China and not Canada. So why bother writing an otherwise positive review? The hat's terrific and I had said as much. Please mention your exclusion criteria more specifically -- as in xenophobic embarrassment in the name of greater profit perhaps? As this is a Christmas Gift for my brother-in-law who is 6ft 3ins I ordered size XL. I must say that I tried it on and it was quite snug and I am a 5ft 6ins woman. I just hope that it fits him. The actual hat looks and feels great and I was very impressed with your service. The ordering process was simple. The delivery was fast... the hat arrived much sooner than I thought it would. The hat is awesome... it looks good, it feels good and it keeps me very warm. My wife got the women's hat in white and we're both very pleased with our purchase. I would highly recommend buying one. Ordering was no problem and it arrived pretty promptly from Canada. Looks just like the pictures and appears well made. It would be ideally be better to have fasteners on the earflaps rather than cords you have to tie; but that's a minor quibble. Overall, nice hat at a fair price. If you want one, buy it; you'll be pleased. The product is of high quality and very comfortable. One aspect I would give consideration to is the way you fasten the flaps under the chin. Tying a knot is not my favorite technique. Previous fur hats I've had use a clip type fastener. Otherwise I really like the product. Well crafted, wonderfully warm hat. Sizing could be better. The last one, a large, was a bit too big and the one I have now, a medium, which replaces the last one which I lost, is a bit too small. Intermediate sizes would be helpful. Both came right away and were in excellent shape. I will certainly recommend your company to others. Great hat! Love it. This is my second hat. I use it Ice Fishing, Snowblowing and Snowplowing with my Quad. I have even used it Ice Fishing in Wawa Canada! The only way to improve the hat would be to put a buckle on the ear flaps. It is kind of a pain tying it when you could just buckle it. The Ushanka fits great, seems warm but will be tested in central and northern Wisconsin for warmth soon. The hat was purchased for a forester. Everything is excellent except it is made in China and the lining of the hat may be a problem after working in the outdoors. I found the web site easy to navigate. I guessed lining was fur but it was polyester. I was disappointed, but this Ushanka was very warm. In fact, I didn't feel cold at all when the temperature was -10 degrees Celsius. I measured the circumference around head and chose Large size, but I felt the hat was a little tight. Delivery (to France) was a bit slow, but perhaps I should have paid extra for the EXPRESS option. The ushanka was all I had hoped for and, although I haven't been able to test it in really cold weather yet, I have no doubt it will keep my head warm in icy conditions. It looks good too. Juts love it! Bought it for my son as a X-Mass gift and he does not want to take it off -- has it on his head the moment he leaves his bed in the morning and hangs next to him when it is time to fall asleep.... very light weighted, cozy, fits good, looks nice, feels great! 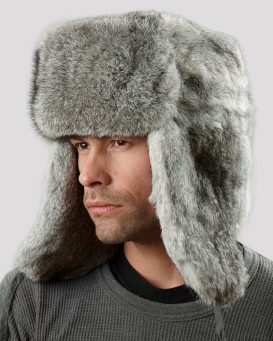 Yes, I used to wear one just like this one when lived in Russia. The hat is excellent. I purchased a second one for my myself after buying the first one for a gift. Fur does not shed all over. Stylish for both Men and Women. If you don't have one, I recommend getting this hat. Shopping experience was great. Hats came in quickly. The hat looks very good. It came quickly by regular shipping. My one disatisfaction is thqat it does not have snaps for the piece over the front that would fall on the forehead. Occasionally with other similar hats, I have lowered that piece when it ws very cold. I would recommend it.